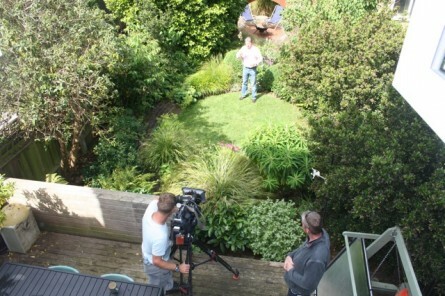 Germinate is delighted to have one of our gardens selected for ITV’s garden makeover show, Love your Garden. 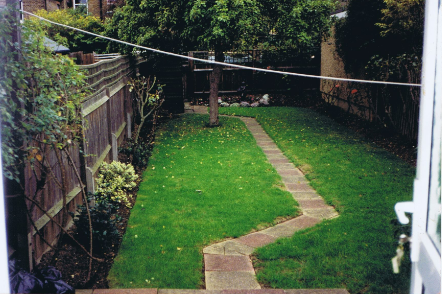 Our Muswell Hill garden was chosen as the inspiration to redesign a struggling garden. It was chosen because of its excellent use of the long and narrow shaped garden, Britain’s most common garden shape. Germinate designed and created the bespoke Muswell Hill garden a little while back. It was created with the clients’ personal needs in mind, which included making the most of the limited space while creating a stunning garden landscape for them to enjoy. 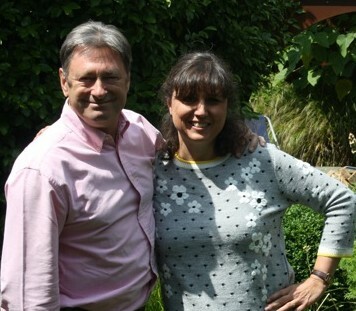 Love your Garden is presented by professional gardener and renowned gardening journalist and broadcaster Alan Titchmarsh. He and his crew spent two days filming the Germinate-designed terraced garden and taking ideas with them that they could replicate to improve a garden in need of a bit of TLC. 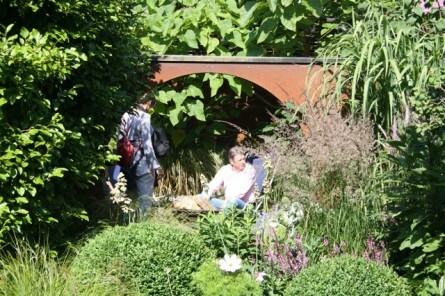 On next week’s episode (Tuesday 22nd July, 2014) you can see how the six main concepts that they chose from Muswell Hill garden are used to reinvigorate a underwhelming and small garden space. 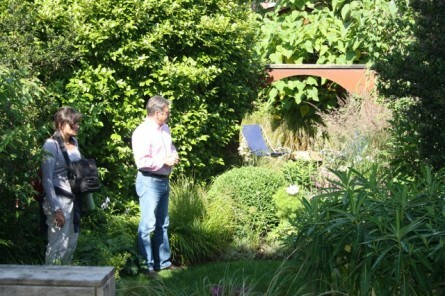 Here we explain what these are and how they have worked together to make the Muswell Hill garden so special. Our featured garden is divided into three clear areas. The Muswell Hill garden enjoys a decked BBQ area for dining, a central verdant area with a lawn abounding with planted borders and a relaxing chill out area with fire pit at the rear. 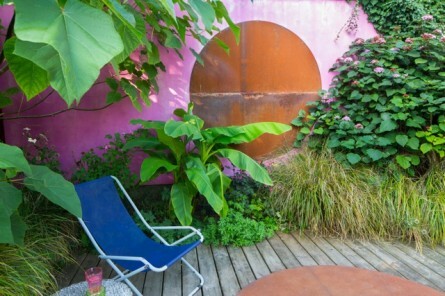 By breaking the continuous length of space into sections, the garden is transformed into a much more interesting space. Incorporating tall plantings into the garden, creates a sense of boundless space because the visitor’s eye can’t register where the garden finishes. Matching height with volume in this way gives the garden scale and completeness. Organic, spherical shapes are dotted throughout the garden, from curved paths to the circular Moongate and central, circular central lawn. 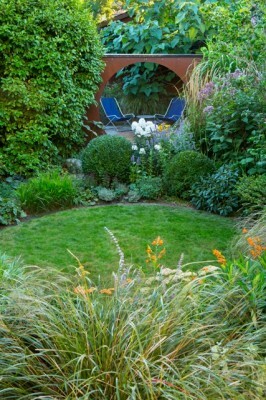 The visual cohesion of the Muswell Hill garden resonated particularly with the Love your Garden team. The “Moongate” is a moon-shaped arc, cut from a sheet of rusted metal. 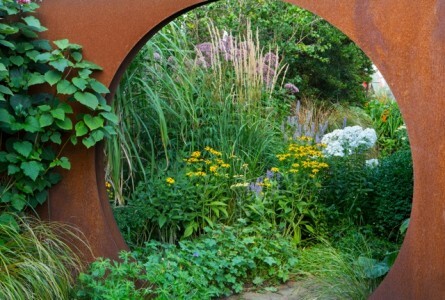 It acts as a divider, with its rustic metal “moon” framing the middle of the garden. The circular theme of the garden is continued in the choice of flora. This shows in the planted box balls, a slow growing and tightly cropped plant, and in the globe shapes of the spread out heads of the the Alliums and Echinops. With visually impressive gardens there is often concern that the more mundane intrusions, such as sheds and compost at the rear of the garden, might become cumbersome and jarring. 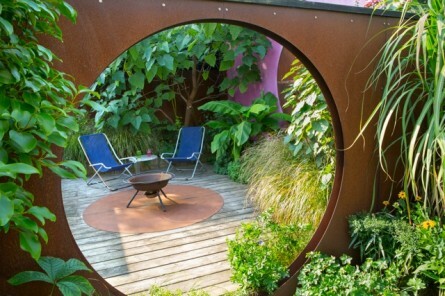 However, these elements can be included within the garden in unobtrusive ways such as by hiding equipment behind the edges of the Moongate frame. The Moongate is not only a striking visual feature at the heart of the garden, it actually serves to conceal parts of the garden, establishing division while creating a sense of mystery. By not being able to perceive the whole garden at once, entering the garden becomes a journey of exploration. This sense of discovery is further encouraged and reinforced by the paths that meander round the garden. By taking the visitor on a winding trail through the greenery, the garden gives the impression of being much larger. Watch how Germinate’s Muswell Hill garden inspires the transformation of a garden on ITV’s Love your Garden this Tuesday 22nd July, at 8 pm. You can now watch the iTV episode on their iPlayer by following this link to Love your Garden (Season 4, Episode 6). ©2016 Germinate Garden Design. All right reserved. Designed and built by GoUp Ltd.